E-FILE FEDERAL HEAVY HIGHWAY VEHICLE USE TAX (HVUT) FORM 2290 TODAY! We’re now ready and accepting 2290 heavy truck tax returns for the tax period beginning from July 1, 2018 to June 30, 2019. Electronic filing (e-File) is the best way to report your 2290 taxes with the IRS; it is fast, easy, secure and safe. The most convenient way of reporting 2290s, is through Tax2290.com. Receive your IRS (stamped) watermarked Schedule-1 “Proof of Payment” in just minutes. Heavy Vehicle Use Tax Reporting: The highway use tax (HVUT Form 2290) applies to highway motor vehicles with a taxable gross weight of 55,000 pounds or more. 2290 tax returns must be filed and tax payments must be paid by August. 31st for the heavy motor vehicles used on the road during July. The deadline generally applies to Form 2290 and the accompanying tax payment for the tax year that begins July 1, 2018, and ends June 30, 2019. For motor vehicles first used after July, the deadline is the last day of the month following the month of first use. E-File your Federal Excise Tax Returns Today! Truckers do not need to visit an IRS office to e-file Form 2290. You can electronically file the Form 2290 and pay any Heavy Highway Vehicle Use Tax due online. Generally, if you e-file Form 2290, you can receive your IRS-stamped Schedule 1 electronically minutes after e-filing. You can print your Schedule 1 and provide it to your state Department of Motor Vehicles without visiting an IRS office. If you choose to visit your local office, be aware that many Taxpayer Assistance Centers now operate by scheduled appointments. Use the Taxpayer Assistance Center Office Locator to see if your local office will require an appointment. For more information about the highway use tax, talk to us or write to us, you can also do a live chat with our tax experts. Electronic filing is the fastest way of getting your return processed by the IRS. Subscribe to FAX service to receive your stamped (watermarked) Schedule-1 copies instantly by fax without any further delay. Start with your 2290 e-File Today! Tax2290.com is the most experienced e-File service provider and the 1st to be certified by IRS since 2007. Rated as the most preferred website for tax 2290 e-filing, serving 1000s of truckers owner operators and trucking companies to get 2290s filed on time with 100% accuracy. The simple to use website, with enhanced usability will be a breeze to file 2290 tax returns online and just spend 10 to 20 minutes and your 2290 e-file is done. Does not need to have complete knowledge on your tax returns when you e-File, we’re there to walk you through the process and guide you screen-by-screen. We’re rated as the most Trusted e-File partner by American Truckers and an allied partner work closely with ATA, OOIDA, WIT, and many state trucking associations to take this service across all truckers. When you choose to e-File your 2290 Federal Highway Use Tax returns with Tax2290.com, rest assure your returns are safer than ever. e-File is at its best with Tax2290.com. Connect with us to get regular updates on IRS tax alerts. Excellent : Your website made my 2290 filing an easy & fast way of filing! As tax practitioners, e-filing IRS Tax form 2290 online will allow you to serve your clients with fewer errors and in lesser time frames. Tax2290.com is an IRS certified provider of Heavy Highway Vehicles Tax (HVUT) Returns and for IRS Tax Form 2290 E-Filing. IRS certified providers like tax2290.com allow Heavy Vehicle Use Tax (HVUT) taxpayers to file their IRS Tax Form 2290 online where the returns are processed faster and with fewer errors. This means quicker HVUT Tax Form 2290 refunds and less contact with the IRS. The mobile version of our ever-safe Heavy Highway Vehicles Tax (HVUT) Form 2290 online e-filing application has been a great success. 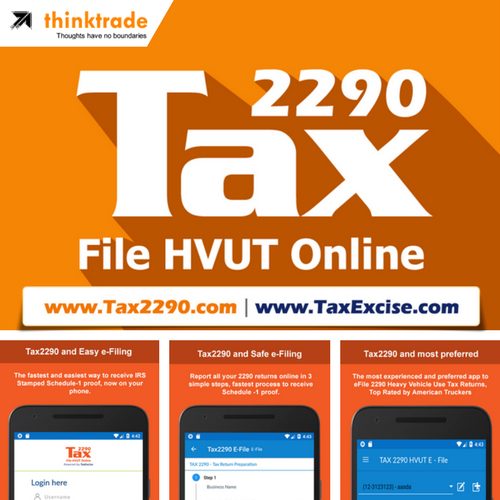 You can easily E-File Heavy Highway Vehicles Tax (HVUT) Form 2290 from anywhere, anytime on simplified screens and get your stamped schedule 1 copy in a jiffy. So take advantage of mobile e-filing of IRS Tax Form 2290 and get your schedule 1 copy wherever you are!